HTC Triumph goes back to the Desire & is on track for a July release with TELUS? In a move to keep people always on their guard and guessing, it looks like TELUS is going back to the original HTC Desire brand name as opposed to the Triumph moniker we saw them using for their highly anticipated Android smartphone. It was roughly two weeks ago when we first heard some echoes about TELUS bringing aboard the HTC Triumph which was basically just a re-branded HTC Desire. 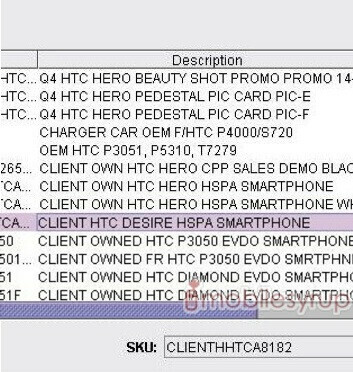 This time around we're seeing a leaked TELUS inventory screen shot that clearly shows the HTC Desire in the system with the Triumph nowhere to be found. The Triumph moniker could've been just a temporary place holder used to keep things under wrap from prying eyes. Moreover, it's still speculated that TELUS customers can expect to see the HTC Desire arrive some time in July.